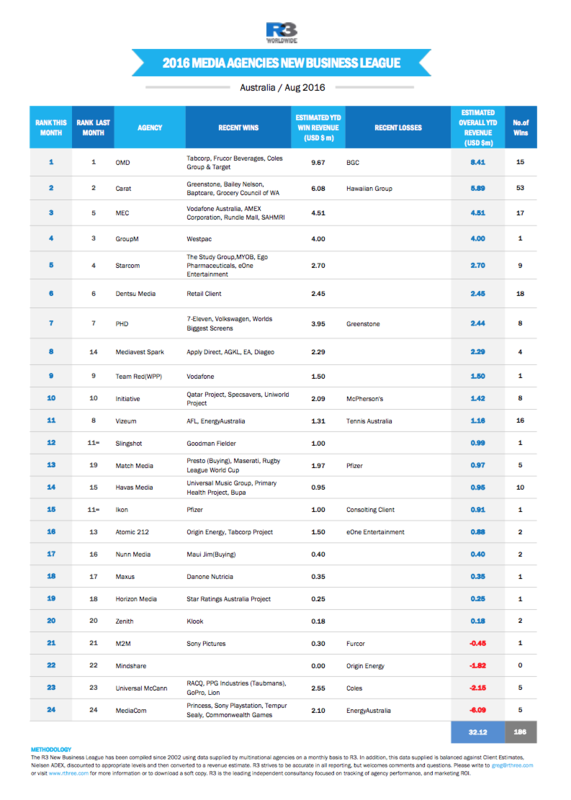 Another month, another win for media firm OMD in R3’s “Media Agencies New Business League” for the month of August. OMD continued its impressive run of new wins including Tabcorp, Frucor Beverages, Coles Group and Target. Carat retained second spot and MEC jumped two spots to third. Arguably the biggest improver was the Publicis-owned Mediavest Spark who jumped six positions to eighth spot with wins that included Apply Direct, AGKL, EA and Diageo. Atomic 212 dropped five spots to 18th despite picking up the media for Origin Energy and Tabcorp Project. Check out the full list for new media agencies wins for August here.